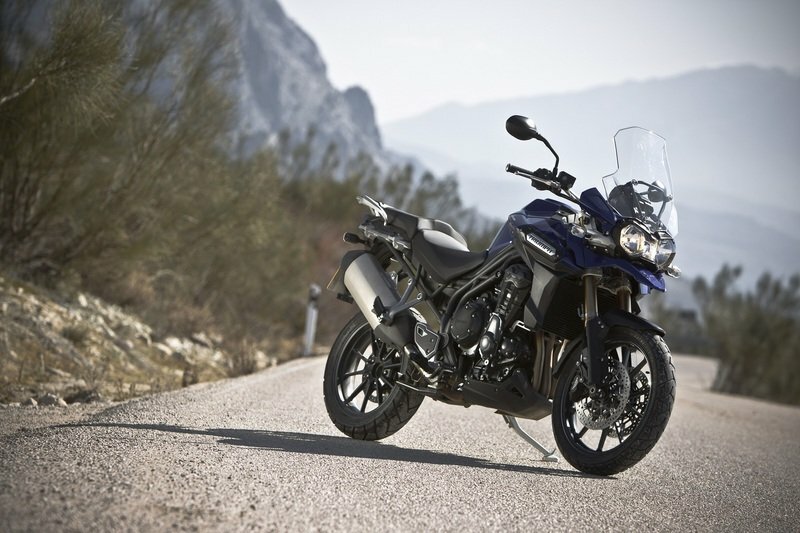 Triumph presents its 2014 Tiger Explorer, a nifty bike which can serve both for street and off road riding. The motorcycle retains Triumph’s core values being reliable, tough and ready to follow your lead with obedience. 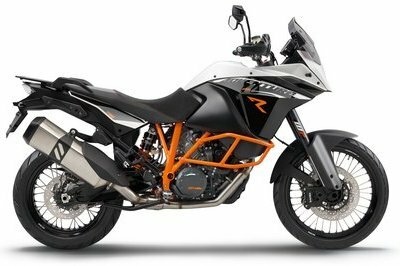 It is propelled by a 1215 cc, liquid cooled, 12 valve, DOHC, in-line three cylinder engine which cranks out a peak power of 137 PS at 9300 rpm and 121 NM of torque at 6400 rpm. As far as efficiency is concerned, the engine delivers an average fuel consumption of 57 Mpg. 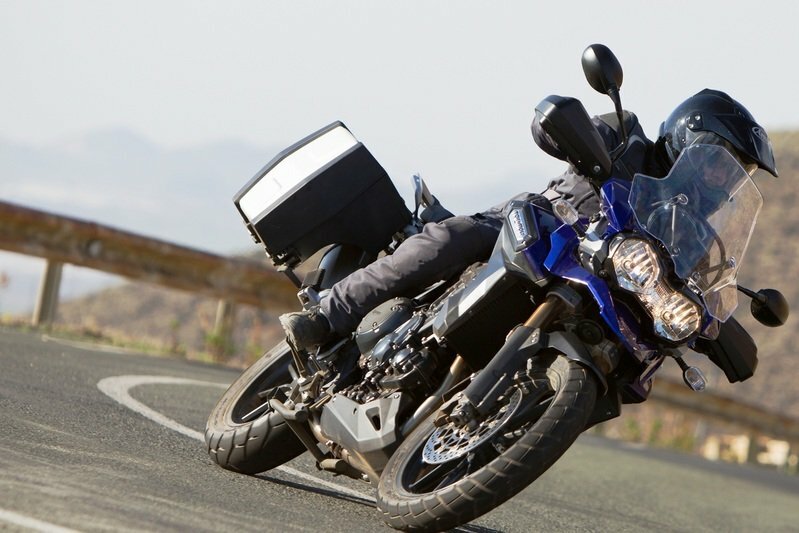 For enhanced performances, the 2014 Triumph Tiger Explorer is fitted with ABS, traction control and cruise control. 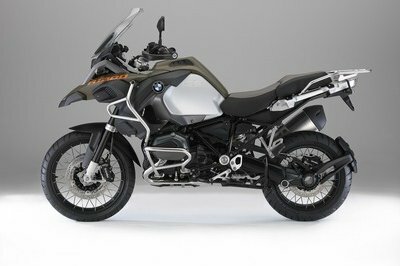 Other features include heated grips, an alloy Belly Pan, engine bars, a fog light kit and a spacious top box. The 2014 Triumph Tiger Explorer is offered with a base price of $15,699. Hit the jump for more information on the 2014 Triumph Tiger Explorer. 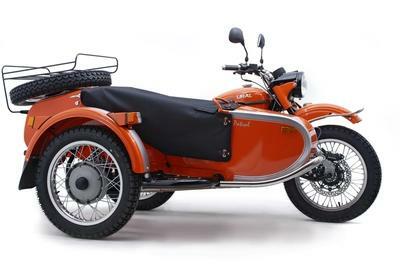 Being a Tiger, this is a bike built for adventure. Exploring new roads, even new countries and not stopping just because the road does. 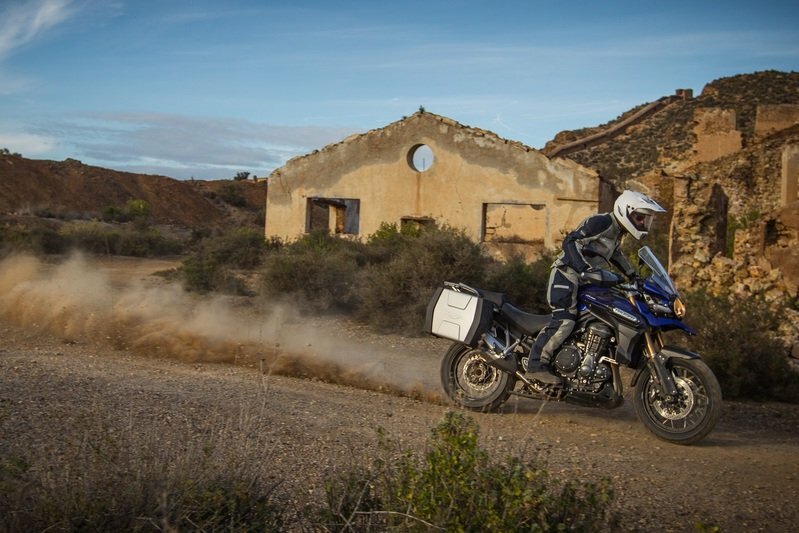 But Triumph made the Tiger Explorer for every rider that wants rugged dependability, long distance comfort, a powerful and torquey engine with an extended fuel range, fine handling and the ability to cope with unmade roads. And Triumph didn’t stop there. Triumph added high levels of sophisticated equipment, including ABS, traction control and cruise control along with the special character that comes with a Triumph three cylinder engine, and handling so natural and easy the bike is just as much at home in town as on the tundra. Triumph gave the Explorer a 1215cc three-cylinder engine. Built with the latest technology to be strong, dependable and have the low maintenance levels you need on long adventures. It has plenty of power and torque with a hefty 137PS at 9300rpm, and 121Nm at just 6400rpm. Useable torque low down in the rev range where you need it most. Triumph designed a rugged transmission comprising of a strong six-speed gearbox and an exceptionally tough shaft final drive. This gives you smooth power delivery yet is capable of dealing with the shocks and knocks it can face off-road. And, it hardly needs any maintenance, so you can get on with your ride without worrying about it. 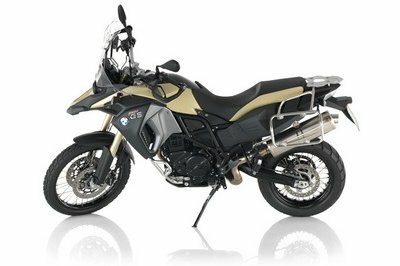 The suspension on the Tiger Explorer is built to cope with any kind of riding condition. Triumph used tough 46mm forks at the front with an extended 190mm of travel, ideal for rough roads and long distance comfort. And at the rear, the single shock provides 194mm of travel and features a hydraulic remote preload adjuster and adjustable rebound damping. Braking is looked after by a pair of 4-piston callipers and twin 305mm discs at the front backed up by a single rear disc, all controlled by our advanced, switchable electronic ABS system. The 10-spoke, cast aluminium wheels, 17 inches diameter at the rear and 19 inches at the front, are perfect for off-road riding and effective at dealing with poor road surfaces. 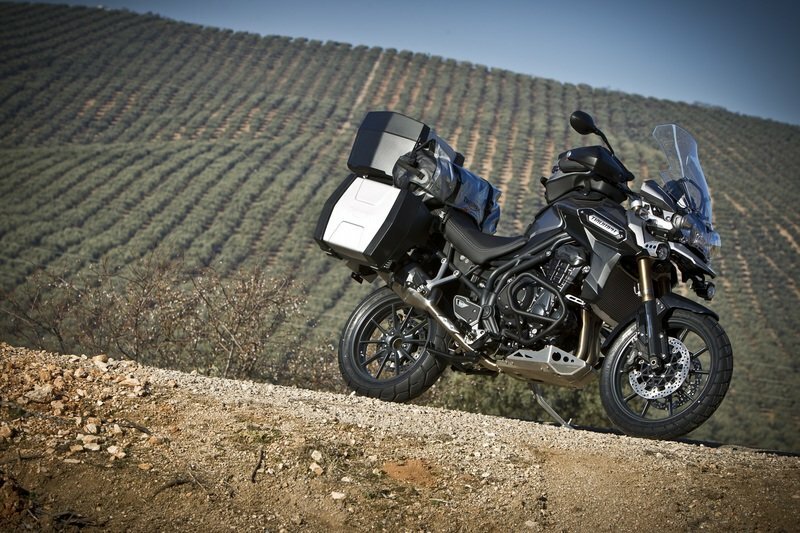 Comfort is crucial on a bike designed for extended touring trips, so for the Tiger Explorer, Triumph has concentrated on that for both the rider and passenger. Triumph added a coded key immobiliser system in case your Explorer attracts the wrong kind of attention. It disables the ignition if an attempt is made to turn or force the ignition switch without the presence of the electronically coded correct key. An option on the Tiger Explorer is spoke wheels and tubeless tyres adding even more off-road ability. The Tiger Explorer tells you everything you need to know on a journey. The LCD instruments use handlebar mounted thumb switches with up/down scroll facility and feature a comprehensive onboard computer including 2 trip meters displaying distance covered, journey time, average speed, average fuel consumption, instant fuel consumption, range to empty. Also visible on the LCD screen is the odometer readout, tyre pressure monitoring system readout (if fitted), heated seat power indicator, cruise control operation information and service interval. There is also an on-screen alert for freezing temperatures as well as a numeric readout for ambient temperature. The Tiger Explorer’s payload is an incredible 222kg. Ideal for those long adventures. 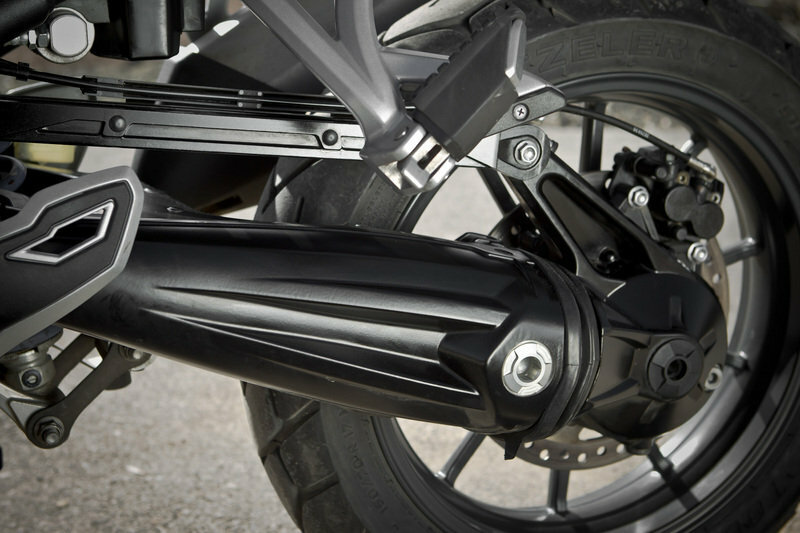 A huge range of accessories has been specifically developed for the Tiger series. All fitted accessories include a 2 year unlimited mileage warranty. Here is just a small selection to view. High performance dual fog lamp kit featuring cast 55w fog lights, drilled and brushed marine grade aluminium shields and an integrated tubular mounting rail. Fabricated steel engine bars finished in durable textured powder coat finish. 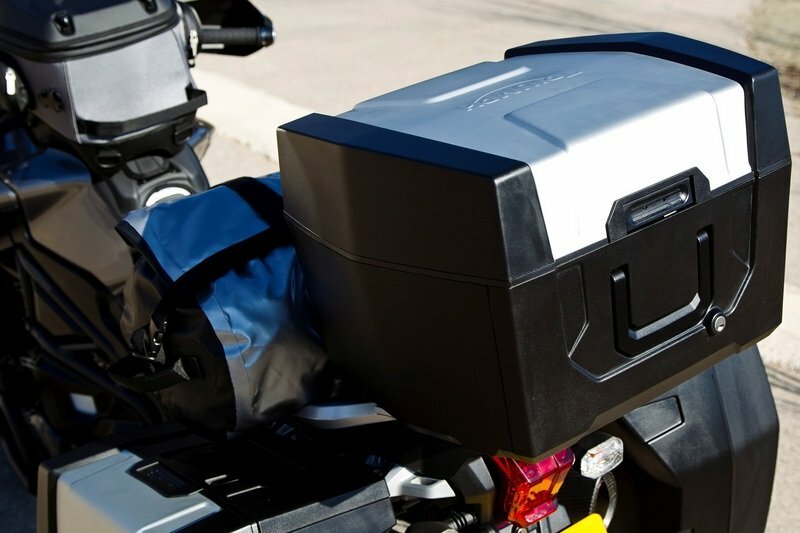 Heavy gauge brushed aluminium Belly Pan designed to complement the styling of the Tiger Explorer. Instrument display and functions LCD instrument pack with digital speedometer, analogue tachometer, gear position indicator, fuel gauge, range to empty, service indicator, clock, air temperature, frost warning, hazard warning lights, trip computer, Tyre pressure monitoring system.